We delayed our departure on the main part of the bike adventure to ensure that my tooth was OK and see about follow-up care. Turns out the follow-up care was a conversation with a dental nurse on the NHS non-emergency phone system. She reassured me that the healing was progressing, and advised me to continue with anti-inflammatories as needed and proceed as planned unless swelling and/or pain returned. Since I didn’t need to actually see a dentist, we had an extra day for London activities. We arrived (almost 3 weeks ago now!) with a fairly short list of tourist activities for London. We checked off a few during the first week, but still had a few remaining. 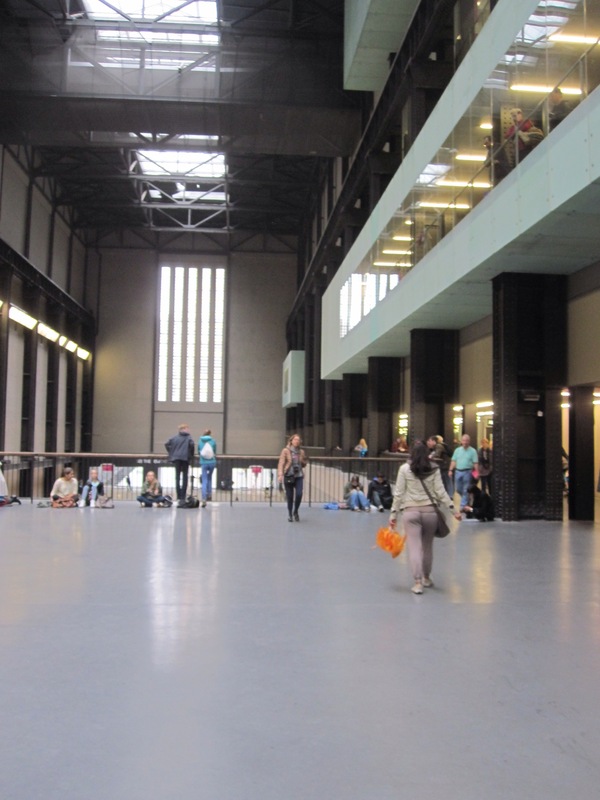 Of those, we chose to visit the Tate Modern. It is unique in that it is housed in a former power plant. Here is a shot of the turbine room. We saw a dance concert in this space when we were here in 2011, but I had not visited the collections before. I thought it would be interesting to go on a guided tour, so we chose the first tour of the day, which focused on surrealism. I always love a good guided tour, because it makes the art come alive and puts it into a context that you just can’t get from the written descriptions or even the audio tours (which I don’t tend to have the attention span for anyway). 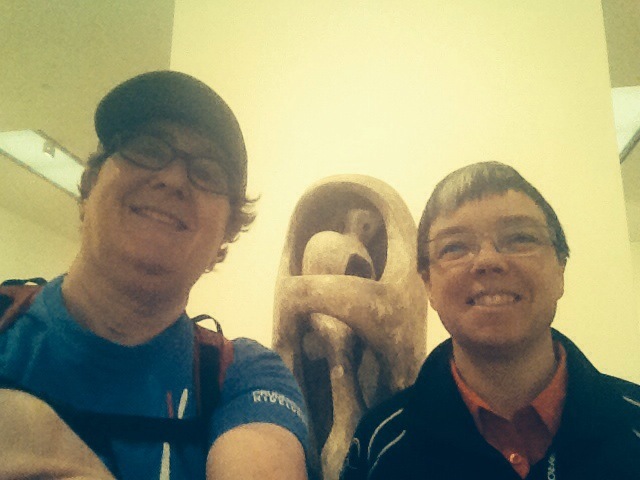 Our guide was very good and shared stories about Dali, Picasso, Max Ernst, and more. After those 45 minutes flew by, we visited the Robert Mapplethorpe and Mark Rothko exhibits before grabbing a salad in the snack bar and (of course) perusing the shop. 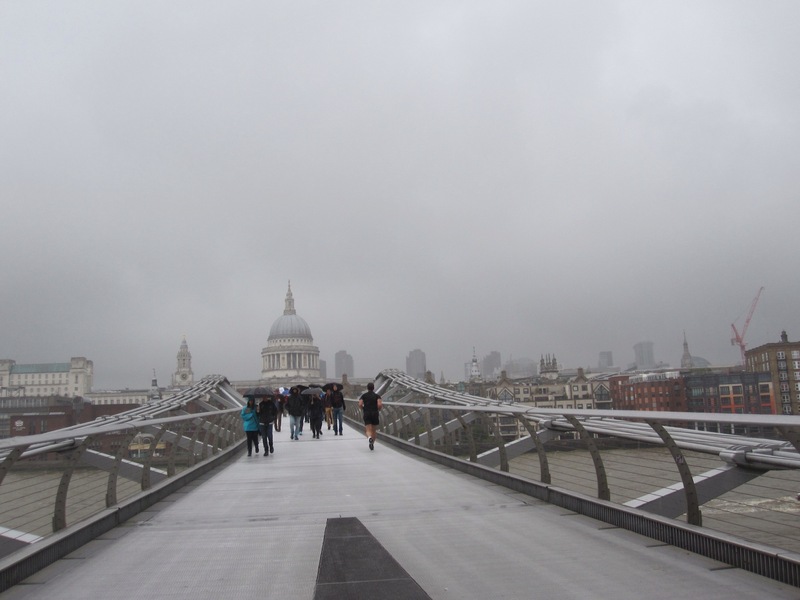 Despite the unpleasant weather, we walked across the Millennium Bridge in order to take a different route back on the Underground. The next order of business was collecting more maps. Transport for London (the Tube folks) publish a set of Local Cycling Guides for London. They are quite nice–and free!–but you have to either plan ahead and get them mailed to a UK address, or go to one of 5 tourist information spots to obtain them (Heathrow and King’s Cross are on the list, so if you know in advance you need bike maps you are likely to be able to get them on your way in). We stopped at Liverpool Street station, as it was most convenient for us. After a couple other short errands, we headed back for the suburbs. Dinner tonight was takeaway from Malay Chinese Noodlebar in Borehamwood. The curry and roti canai were flavorful and just what we needed to get excited for packing up. I love Robert Maplethorpe! Check out the audiobook Just Kids by Patti Smith!!! The Mapplethorpe exhibit was 3 full rooms of photos, including three of Patti Smith. My favorites were a playful self-portrait from the 70s and a photo of Keith Haring that immediately evoked images of his art.